I am really a beginner with this king of solution... it is my first experience with the continuous integration. I develop with cpp since four years, but always with more or less little projects. So the first step was to install : visualSVN, tortoiseSVN and finally TeamCity. Without problems for the moment. I created a new VCS root : Subversion, ... the Test Connection was OK. 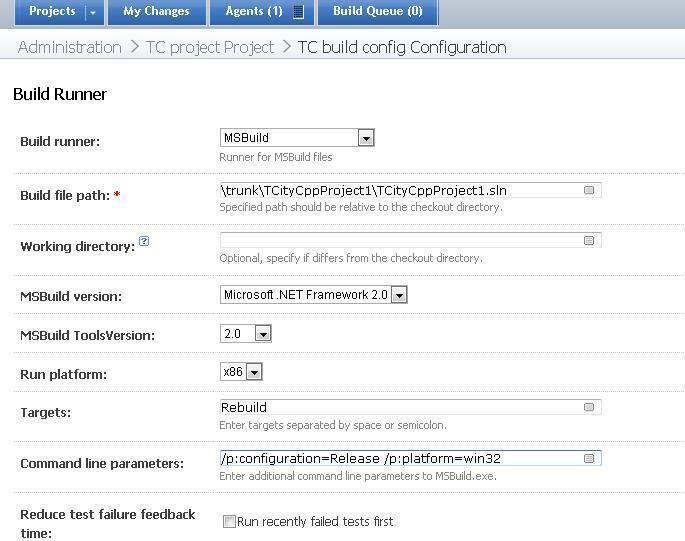 The specified solution configuration "Release|MCD" is invalid. 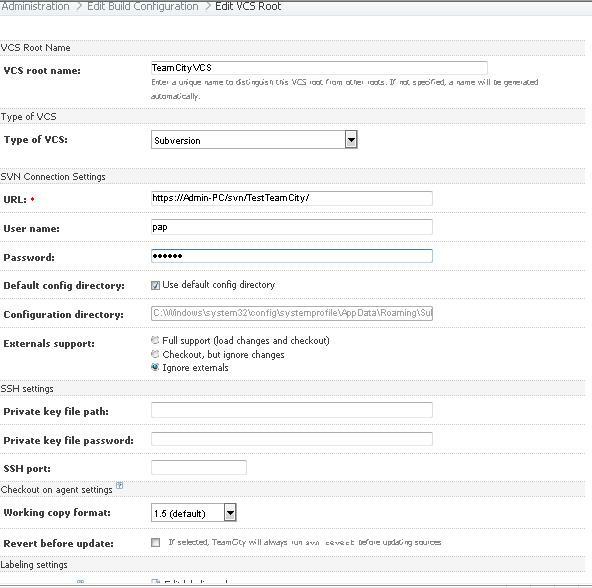 Please specify a valid solution configuration using the Configuration and Platform properties (e.g. 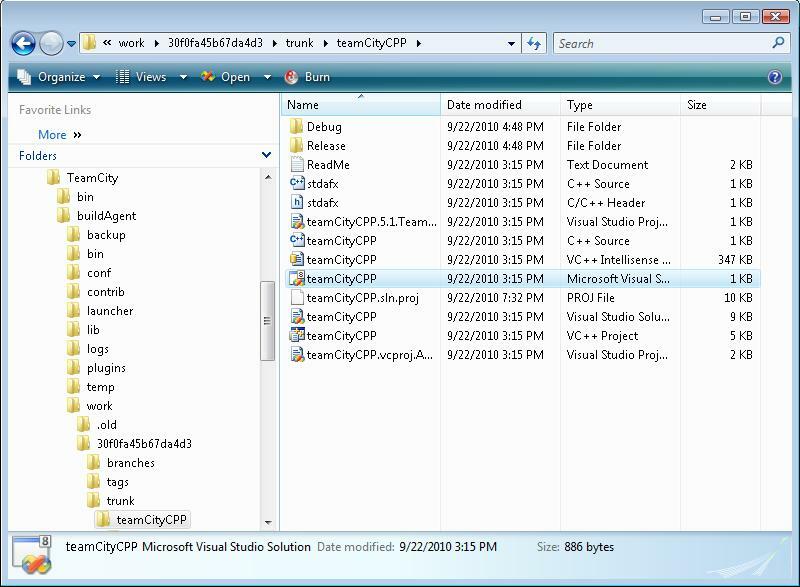 MSBuild.exe Solution.sln /p:Configuration=Debug /p:Platform="Any CPU") or leave those properties blank to use the default solution configuration. I tried other seetings, but they always failed too. So if someone could help me, it will be very helpfull for me. Can you please try to run solution using MSBuild.exe from command line under the same user account at the agent machine? I meant to run it without TeamCity. 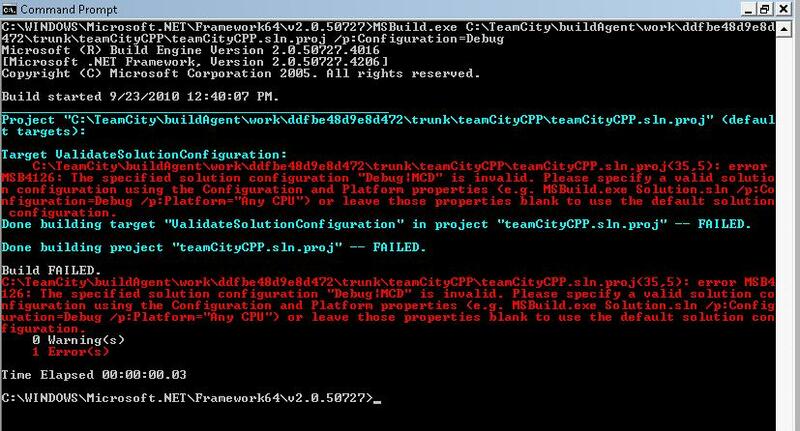 Try run the build with MSBuild.exe from commandline on the build agent from the same directory under the same user account as used to run build agent but without TeamCity. Pierre, I noticed you have selected x64 msbuild. Do you really need this? This could be an issue for c++ builds. Please open configuration manager in VS and make sure you have all configurations defined in all projects. error MSB4126 : the specified solution configuration "Debug|MCD" is invalid. As workaround you may use commandline build runner and run deven.exe there to build your solution from commandline mode. To tell the truth, there is VCBuild that is called from MSBuild to build your solution. 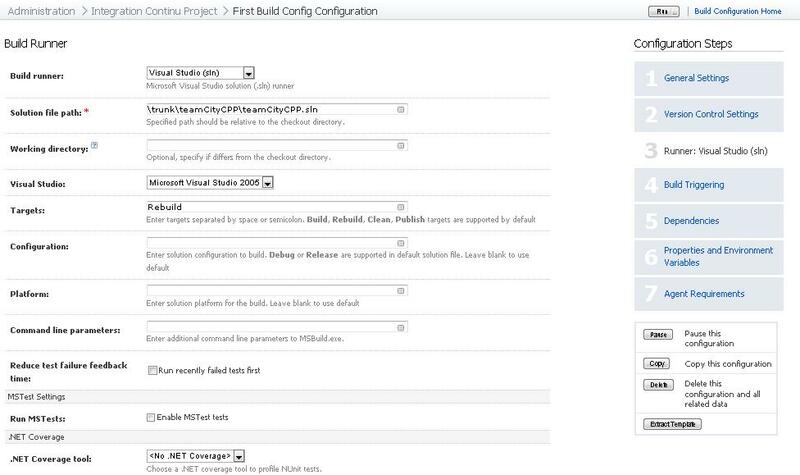 Visual Studio uses tuned version of MSBuild to run the build. Please check you run the build under administrative account. Make sure you have checked in all sources from your personal PC. Will the build be working if you setup build agent on that PC? Will the build be working if you checkout in to another folder and run with msbuild.exe <path-to-solution>.sln? You may need to check PATH variables on the build agent. 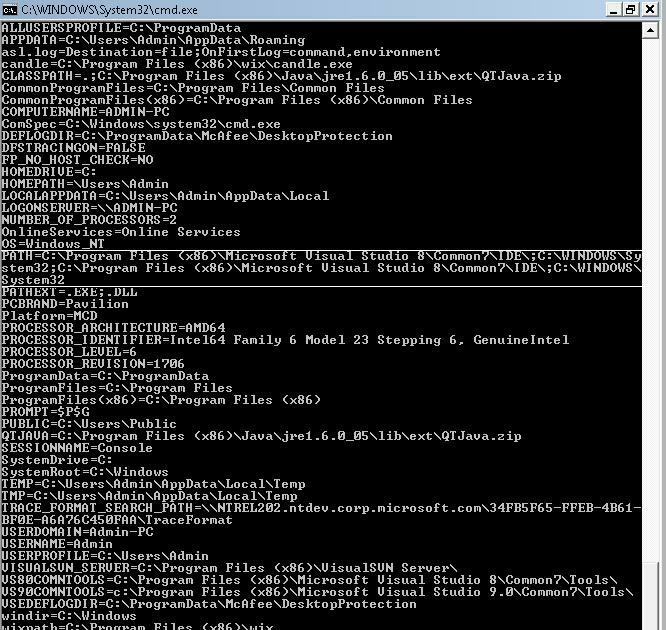 I checked in IDE folder, and the mspdbsrv.exe and mspdb80.dll are there. And about your message, how can I check PATH variables on the build agent? I have attached the Build Parameters, is it normal? And is it linked with your last message? 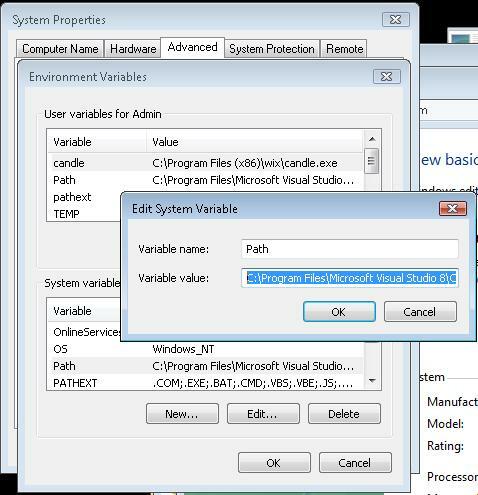 I would recommend you to add VS to PATH variable in the system settings. To check actual path variables, consider running a build with commandline runner with process "cmd.exe" and arguments "/c set"
I did the build as you specified, and the build was successed. Finaly I found the solution of my problem!!!!!!!! I can breath now, hehe !!!!!!! Well, many thanks about the time you took to answer me!!! !